↑ Shirbon, Estelle (20 March 2018). "Stephen Hawking to Join Newton, Darwin in Final Resting Place". London: Reuters. https://www.reuters.com/article/us-britain-hawking-ashes/stephen-hawking-to-join-newton-darwin-in-final-resting-place-idUSKBN1GW2GV. अन्तिम पहुँच तिथि: 21 March 2018. ↑ २.० २.१ Ferguson 2011, p. 29. ↑ Price, Michael Clive (February 1995). "THE EVERETT FAQ" Archived 20 April 2016 at the Wayback Machine.[]. Department of Physics, Washington University in St. Louis. Retrieved 17 December 2014. ↑ Henry, David (14 March 2018). "Stephen Hawking, physicist who reshaped cosmology, passes away at 76". The Economic Times. 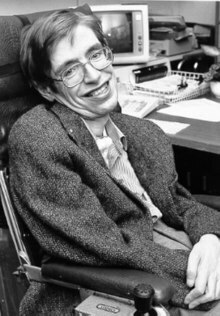 https://economictimes.indiatimes.com/magazines/panache/physicist-stephen-hawking-passes-away/articleshow/63294700.cms. अन्तिम पहुँच तिथि: 15 March 2018. ↑ ८.० ८.१ ८.२ Ferguson 2011, p. 21. ↑ White & Gribbin 2002, p. 6. ↑ Larsen 2005, pp. 2, 5. ↑ १५.० १५.१ १५.२ १५.३ १५.४ Ferguson 2011, p. 22. ↑ Larsen 2005, p. xiii. ↑ White & Gribbin 2002, p. 12. ↑ Ferguson 2011, pp. 22–23. ↑ White & Gribbin 2002, pp. 11–12. ↑ White & Gribbin 2002, p. 13. ↑ २१.० २१.१ Larsen 2005, p. 3. ↑ २३.० २३.१ Ferguson 2011, p. 24. ↑ White & Gribbin 2002, p. 8. ↑ My brief history – Stephen Hawking (2013). ↑ White & Gribbin 2002, pp. 7–8. ↑ Larsen 2005, p. 4. ↑ Ferguson 2011, pp. 25–26. ↑ White & Gribbin 2002, pp. 14–16. ↑ Ferguson 2011, p. 26. ↑ White & Gribbin 2002, pp. 19–20. ↑ ३२.० ३२.१ Ferguson 2011, p. 28. ↑ Ferguson 2011, pp. 28–29. ↑ White & Gribbin 2002, pp. 46–47, 51. ↑ ३५.० ३५.१ Ferguson 2011, pp. 30–31. ↑ Hawking 1992, p. 44. ↑ White & Gribbin 2002, p. 50. ↑ White & Gribbin 2002, p. 53. ↑ ३९.० ३९.१ ३९.२ ३९.३ Ferguson 2011, p. 31. ↑ White & Gribbin 2002, p. 54. ↑ White & Gribbin 2002, pp. 54–55. ↑ White & Gribbin 2002, p. 56. ↑ Ferguson 2011, pp. 31–32. ↑ Ferguson 2011, p. 33. ↑ White & Gribbin 2002, p. 58. ↑ Ferguson 2011, pp. 33–34. ↑ White & Gribbin 2002, pp. 61–63. ↑ Ferguson 2011, p. 36. ↑ White & Gribbin 2002, pp. 69–70. ↑ Ferguson 2011, p. 42. ↑ White & Gribbin 2002, pp. 68–69. ↑ Ferguson 2011, p. 34. ↑ White & Gribbin 2002, pp. 71–72. ↑ Ferguson 2011, pp. 43–44. ↑ ५६.० ५६.१ Ferguson 2011, p. 47. ↑ Larsen 2005, p. xix.